RentMeAHandbag.com Outlet Store - Buy women's Dolce Gabbana handbags, shoes and clothing and men's Dolce Gabbana clothing at discount prices. 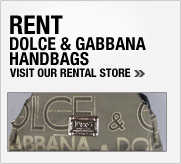 Buy Dolce & Gabbana women's shoes, Dolce & Gabbana handbags and women's clothing and men's clothing for discount prices at RentMeAHandbag.com's Outlet Store. You can get great prices on new and slightly used Dolce & Gabbana products. 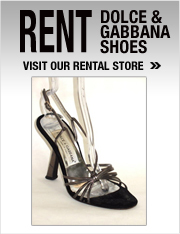 Or rent Dolce & Gabbana shoes, handbags and clothing in our rental store.